The yield of wheat (Triticum aestivum L.), an important crop, is adversely affected by heat stress in many regions of the world. However, the molecular mechanisms underlying thermotolerance are largely unknown. A novel ferritin gene, TaFER, was identified from our previous heat stress-responsive transcriptome analysis of a heat-tolerant wheat cultivar (TAM107). TaFER was mapped to chromosome 5B and named TaFER-5B. Expression pattern analysis revealed that TaFER-5B was induced by heat, polyethylene glycol (PEG), H2O2 and Fe-ethylenediaminedi(o-hydroxyphenylacetic) acid (Fe-EDDHA). To confirm the function of TaFER-5B in wheat, TaFER-5B was transformed into the wheat cultivar Jimai5265 (JM5265), and the transgenic plants exhibited enhanced thermotolerance. To examine whether the function of ferritin from mono- and dico-species is conserved, TaFER-5B was transformed into Arabidopsis, and overexpression of TaFER-5B functionally complemented the heat stress-sensitive phenotype of a ferritin-lacking mutant of Arabidopsis. Moreover, TaFER-5B is essential for protecting cells against heat stress associated with protecting cells against ROS. In addition, TaFER-5B overexpression also enhanced drought, oxidative and excess iron stress tolerance associated with the ROS scavenging. Finally, TaFER-5B transgenic Arabidopsis and wheat plants exhibited improved leaf iron content. Our results suggest that TaFER-5B plays an important role in enhancing tolerance to heat stress and other abiotic stresses associated with the ROS scavenging. Most of the world’s wheat growing areas are frequently subject to heat stress during the growing season. High temperatures adversely affect wheat yield and quality . Over the past three decades (1980–2008), heat stress has caused a decrease of 5.5% in global wheat yields . Thus, research on the molecular mechanism of thermotolerance and the development of new wheat tolerant varieties using classical breeding techniques and biotechnological approaches is increasingly important. As sessile organisms, plants have evolved various response mechanisms to adapt to abiotic stress, particularly molecular responses to maintain normal life activities [3–6]. Genes that respond to adverse growth conditions are essential for enhancing abiotic stress tolerance and developing stress-tolerant crops. Iron is an essential nutrient for all cells. However, excess free iron is harmful to cells because it promotes the formation of free radicals via the Fenton reaction. Thus, iron homeostasis must be well controlled. As iron-storage proteins, ferritins play important roles in sequestering or releasing iron upon demand . Ferritins are a class of 450-kDa proteins consisting of 24 subunits, which are present in all cell types . In contrast to animal ferritins, subcellular localization of plant ferritins in the cytoplasm has not been reported. Plant ferritins are exclusively targeted to plastids and mitochondria [9–12]. The model plant Arabidopsis contains four ferritin genes: AtFER1, AtFER2, AtFER3 and AtFER4. Hexaploid wheat contains two ferritin genes that map to chromosomes 5 and 4, and each of the individual homeoalleles can be located to the A, B or D genome . Thus, ferritin genes are conserved throughout the plant kingdom, and two genes per genome have been identified in all studied cereals . Transcriptome analysis of plant responses to stress has identified a number of genes. In plants, ferritin gene expression was induced in response to drought, salt, cold, heat and pathogen infection [9, 14]. Arabidopsis ferritin genes were induced by treatment with H2O2, iron and abscisic acid (ABA); however, not all four AtFER genes were induced . Ferritin was up-regulated in response to drought in the SSH (Suppression Subtractive Hybridization) cDNA library of soybean nodules . Overexpression of ferritin also significantly improved abiotic stress tolerance in grapevine plants . Oxidative damage of biomolecules is a common trait of abiotic stress. If oxidative damage is not well controlled, it can ultimately trigger programmed cell death (PCD) . Thus, reactive oxygen species (ROS) must be tightly managed by enhancing ROS scavenging and/or reinforcing pathways preventing ROS production. In addition to buffering iron, previous studies have also revealed that plant ferritins protect cells against oxidative damage . However, little information is known about ferritin gene functions involved in tolerance to heat and other abiotic stresses. We previously analysed the genome-wide expression profiles of wheat under heat-stress conditions and identified a large number of genes responding to heat stress, including ferritin genes . In the present study, the expression patterns of TaFER-5B in seedlings treated by various stress were studied, and the relationship between ferritins and thermotolerance was elaborated. Microarray analysis using the Affymetrix Genechip® Wheat Genome Array indicated that the probe Ta.681.1.S1_x_at was induced 29.08-fold after high-temperature treatment for 1 h . Based on the probe sequence, we cloned the full-length open reading frame of this gene (TaFER, accession no. GenBank KX025176; Additional file 1) from wheat cultivar “TAM107”. The coding sequence shares 97.15%, 99.66%, and 97.15% homology with sequences on chromosomes 5A, 5B, and 5D, respectively, of the recently published wheat cultivar Chinese Spring (CS) genome (International Wheat Genome Sequencing Consortium, 2014). The sequence on chromosome 5B corresponds to the original heat-responsive transcript named TaFER-5B. Comparison of the amino acid sequences between TaFER-5B and ferritin genes from the model plant Arabidopsis revealed that TaFER-5B is a conserved gene containing the transit peptide domain responsible for plastid localization, an adjoined extension peptide domain involved in protein stability and five helixes (Fig. 1) [20–22]. The amino acid sequence of TaFER-5B exhibits 60.47% identity with AtFER1, 62.26% identity with AtFER2, 61.69% identity with AtFER3, and 60.92% identity with AtFER4 (Fig. 1), and phylogenetic tree analysis revealed higher identity with the ferritins from maize, rice and barley (Additional file 2: Figure S1; Additional file 3). The expression patterns of ferritin genes in wheat under diverse abiotic stress conditions were analysed by RT-qPCR using gene-specific primers (Fig. 2). TaFER-5B expression increased significantly and peaked at 3 h after heat treatment at 40 °C. After long-term heat-stress treatment (12 h), TaFER-5B expression decreased, but increased mRNA abundance was maintained (Fig. 2a). We also analysed the expression level of TaFER-5B under PEG, H2O2 and Fe-EDDHA conditions. TaFER-5B expression gradually increased and peaked at 12 h of treatment (Fig. 2b, c and d). These results demonstrate that TaFER-5B expression is induced by heat, PEG, H2O2 and Fe-EDDHA treatment. To gain insight into the function of TaFER-5B, TaFER-5B under the control of the maize ubiquitin promoter was transformed into wheat cultivar Jimai5265 (JM5265) by particle bombardment. In total, 15 transgenic events were produced, and integration of the ferritin gene was confirmed by PCR analysis with specific corresponding primers. The transgenic lines were analysed over the T1 and T2 generations. Three lines (W-L1, W-L2 and W-L3) that exhibited up-regulation of TaFER-5B in shoots at the early seedling stage (Additional file 4: Figure S2) were selected for further analysis. Growth and stress resistance phenotypes were investigated at the seedling stage grown under normal and heat-stress conditions. Under normal conditions, the TaFER-5B transgenic lines exhibited no obvious differences (Fig. 3a). However, under heat-stress conditions, wild type (WT) wilted more rapidly than the TaFER-5B transgenic lines after heat stress at 45 °C for 18 h and recovery at 22 °C for 5 d. (Fig. 3b). As a parameter for evaluating stress-induced membrane injury, electrolyte leakage is often used to analyse plant tolerance to stress. Thus, we further evaluated electrolyte leakage with detached leaves under heat-stress conditions. The TaFER-5B transgenic lines exhibited reduced electrolyte leakage with detached leaves compared with JM5265 under heat-stress conditions (Fig. 3c). Under heat-stress conditions, photosynthetic activity was markedly reduced and accompanied by direct and indirect photosynthetic system damage. The ratio of variable to maximal fluorescence (Fv/Fm) is an important parameter used to assess the physiological status of the photosynthetic apparatus. Environmental stress that affects photosystem II efficiency decreases Fv/Fm. Previous studies have indicated that disturbance of the electron flow under moderate heat stress might be an important determinant of heat-derived damage of the photosynthetic system . 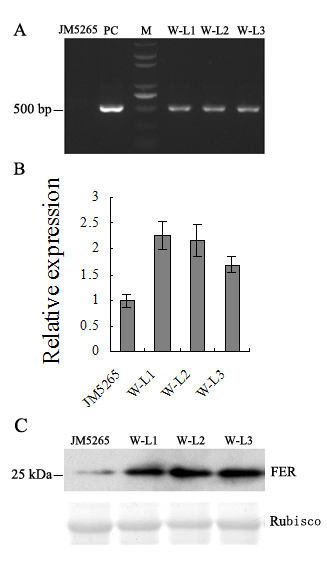 Fv/Fm values in TaFER-5B transgenic lines were increased compared with JM5265 under heat-stress conditions, whereas no significant difference was observed under control conditions (Fig. 3d). These results indicate that TaFER-5B protects photosynthetic activity under heat-stress conditions. The role of the ferritin gene in thermotolerance in Arabidopsis has not been characterized. To determine whether the function of ferritin from mono- and dico-species is conserved, the Arabidopsis ferritin gene triple mutant fer1-3-4 (lacking three isoforms expressed in vegetative tissues, AtFER1, 3 and 4) and quadruple mutant fer1-2-3-4 (lacking all ferritin isoforms) were created by crossing the single mutant as described previously [19, 24] (Additional file 5: Figure S3). Then, we transformed 35S::TaFER-5B into WT and fer1-2-3-4 plants. 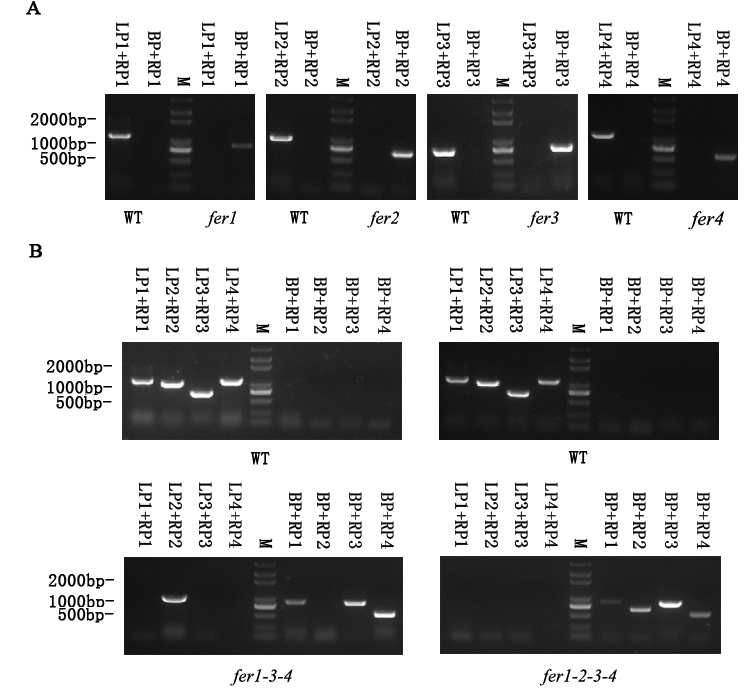 Detection of protein expression levels by Western blot analysis revealed that the expression level of ferritin increased in the overexpression lines (A-L1 and A-L2) compared with WT (Additional file 6: Figure S4A) but decreased in fer1-2-3-4 and fer1-3-4 plants compared with WT (Additional file 6: Figure S4B). As shown in Additional file 6: Figure S4B, ferritin protein levels in fer1-2-3-4 plants complemented by the TaFER-5B gene (A-CL1) were very similar to those in WT plants. No obvious morphological differences were observed in the transgenic lines at different developmental stages (data not shown). Thus, fer1-2-3-4, fer1-3-4, A-L1, A-L2, A-CL1 and WT plants were analysed in further experiments. First, we examined the survival rate of these lines after heat stress. Briefly, 7-day-old seedlings grown at 22 °C were subjected to heat-stress treatment at 45 °C for 2 h. After recovery at 22 °C for 7 days, only 10% of fer1-2-3-4 and fer1-3-4 plants survived, whereas approximately 70% of WT plants survived (Fig. 4a). As shown in Fig. 4b, TaFER-5B overexpression functionally complemented the heat stress-sensitive phenotype of fer1-2-3-4 plants. In addition, TaFER-5B transgenic lines also exhibited an enhanced thermotolerance phenotype compared with WT plants (data not show). We further evaluated electrolyte leakage with detached leaves under heat-stress conditions. Detached leaves of fer1-2-3-4 and fer1-3-4 leaked more electrolytes than WT and A-CL1 leaves, whereas A-L1 and A-L2 leaked fewer electrolytes than WT leaves (Fig. 4c). Fv/Fm values were A-L2 > A-L1 > A-CL1 > WT > fer1-3-4 > fer1-2-3-4 under heat-stress conditions, whereas no significant differences were observed under control conditions (Fig. 4d). These results also suggest a role of TaFER-5B in thermotolerance in Arabidopsis. A number of recent studies have suggested that ferritin protects plant cells from oxidative damage induced by a wide range of stress. Under normal conditions, the fer1-3-4 mutant leads to enhanced ROS production and increased activity of several reactive oxygen species (ROS) detoxifying enzymes in leaves and flowers . These results indicate that fer1-3-4 compensates for and bypasses the lack of safe iron storage in ferritins by increasing the capacity of ROS-detoxifying mechanisms . However, when Arabidopsis plants are irrigated with 2 mM Fe-EDDHA, the lack of ferritins in fer1-3-4 plants strongly impairs plant growth and fertility. Thus, under high-iron conditions, free-iron-associated ROS production overwhelms the scavenging mechanisms activated in the fer1-3-4 mutant . To further determine whether ferritin enhances thermotolerance associated with protecting cells against ROS, we evaluated the accumulation of superoxide radical anions (O2−) and H2O2 under heat-stress conditions. O2− was detected with nitroblue tetrazolium (NBT) staining, and H2O2 was measured by diaminobenzidine tetrahydrochloride (DAB) staining . We also examined the H2O2 content and the enzyme activities of catalase (CAT) and glutathione reductase (GR) under normal and heat-stress conditions. In wheat, transgenic lines accumulated less ROS than JM5265 under stress conditions (Fig. 5a and b). CAT and GR enzyme activities were also positively correlated with ROS content (Fig. 5c and d). These results indicate that overexpression of TaFER-5B in wheat effectively alleviates the accumulation of ROS. In Arabidopsis, even under normal conditions, differences were noted among fer1-2-3-4, fer1-3-4, A-L1, A-L2, A-CL1 and WT plants. Compared with WT, fer1-2-3-4 and fer1-3-4 exhibited enhanced H2O2 content and CAT and GR activities, consistent with a previous report . In overexpression and complemented lines, the O2− and H2O2 content and the two enzyme activities decreased (Fig. 6a, b, c and d). These results indicate that overexpression of TaFER-5B in Arabidopsis effectively alleviated the accumulation of ROS. As mentioned above, TaFER-5B was also induced by PEG, H2O2 and excess iron treatment (Fig. 2b, c and d), suggesting that TaFER-5B may be involved in an intricate network for abiotic stress responses. To investigate the role of TaFER-5B in these abiotic stresses, we examined the effect of TaFER-5B on drought stress, oxidative stress and excess iron stress tolerance in wheat. The TaFER-5B transgenic lines exhibited significantly greater total root length in the presence of 10% PEG, 2 mM Fe-EDDHA or 1.5 mM H2O2 (Figs. 7a and b). The H2O2 content and CAT and GR enzyme activities were also dramatically decreased in the TaFER-5B transgenic lines (Fig. 7c, d and e). These results suggest that overexpression of TaFER-5B in wheat enhances drought, oxidative and excess iron stress tolerance associated with the ROS scavenging. In Arabidopsis, we also investigated tolerance to the above stresses in fer1-2-3-4, fer1-3-4, A-L1, A-L2, A-CL1 and WT plants. After 10 d of exposure to 10% PEG, 2 mM Fe-EDDHA or 1.5 mM H2O2, the total roots of the A-L1, A-L2 and A-CL1 lines were significantly longer than those of WT and fer1-2-3-4 (Fig. 8a and b). Consistent with this result, H2O2 content and CAT and GR activities were significantly decreased in the A-L1, A-L2 and A-CL1 lines compared to WT and fer1-2-3-4 (Fig. 8c, d and e). These data indicate that TaFER-5B is essential for enhancing abiotic stress tolerance associated with the ROS scavenging. To confirm the function of TaFER-5B in improving iron content in transgenic plants, ICP-AAS was used to analyse the iron concentration. In the shoots of transgenic Arabidopsis plants and mutants before bolting, the iron content displayed the same trend as ferritin protein levels (Fig. 9a and Additional file 6: Figure S4), and 10-day-old transgenic wheat plants exhibited similar results (Fig. 9b). As a major crop, we were more concerned about the iron content in the seeds of transgenic wheat. However, the results revealed no significantly differences in iron content in seeds between JM5265 and transgenic plants (Fig. 9c). This finding is consistent with the previous results . Previous overexpression of GmFer in wheat and rice driven by the maize ubiquitin promoter resulted in improvements in the iron content in the vegetable tissue without significant changes in seeds. Supporting this finding, Arabidopsis ferritins store only approximately 5% of the total seed iron and do not constitute the major seed iron pool . Heat and drought stress have an adverse impact on crop productivity and quality worldwide. Plants have evolved various response mechanisms for heat and drought stress, particularly molecular responses, to maintain normal life activities [3, 4, 27]. Forward and reverse genetics have been applied to identify key molecular factors that facilitate crop acclimation to environmental stress. In this study, we successfully cloned the gene TaFER-5B and elucidated its function in tolerance to heat and other abiotic stresses in Arabidopsis and wheat. Plant and animal ferritins evolved from a common ancestor gene. Animal ferritins contain two types of subunits, referred to as H- and L-chains. All plant ferritins all share higher identity with the H-chains of animal ferritins. In cereals, there are two ferritin genes per haploid genome. In hexaploid wheat, TaFer1 and TaFer2 are located on chromosomes 5 and 4, respectively, and three homeoalleles of each gene are located in the A, B and D genomes, respectively . 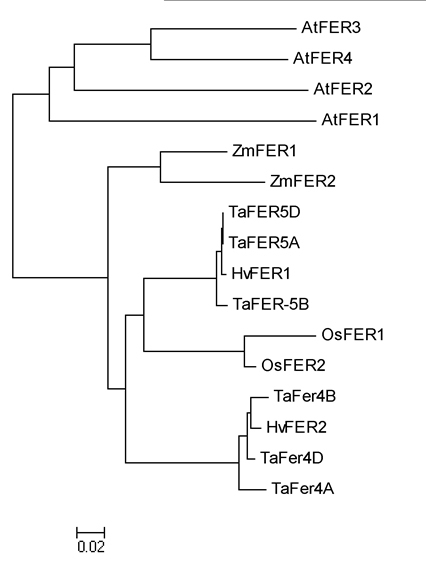 Similar to other plant ferritin genes, the gene structure of TaFER-5B contains seven introns and eight exons (data not show). Ferritin subunits are synthesized as a precursor, and the N-terminal sequence consists of two domains: the transit peptide and the extension peptide (Fig. 1a). The transit peptide domain has higher variability and is absent in the mature ferritin subunit; the transit peptide domain is responsible for plastid localization. The adjacent extension peptide domain present in the mature ferritin subunit is involved in protein stability . In sea lettuce ferritins, the extension peptide contributes to shell stability and surface hydrophobicity . The removal of the extension peptide in pea seed ferritin both increases protein stability and promotes the reversible dissociation of the mature ferritin protein . The secondary structure of pea seed ferritin is highly similar to that of mammalian ferritin . The ferritin cage structure is assembled from 24 individual four-helix bundle subunits (A, B, C, and D in Fig. 1a) and is conserved in plant and animal ferritins. In plants, which diverged from their animal counterparts, the ferritins also contain a smaller and highly conserved C-terminal E-helix that participates in the formation of the fourfold axis and is involved in electron transfer . In this study, the probe corresponding to TaFER-5B was induced by heat stress . RT-qPCR analysis demonstrated that this gene was induced by heat treatment and peaked at 3 h of treatment (Fig. 2a). 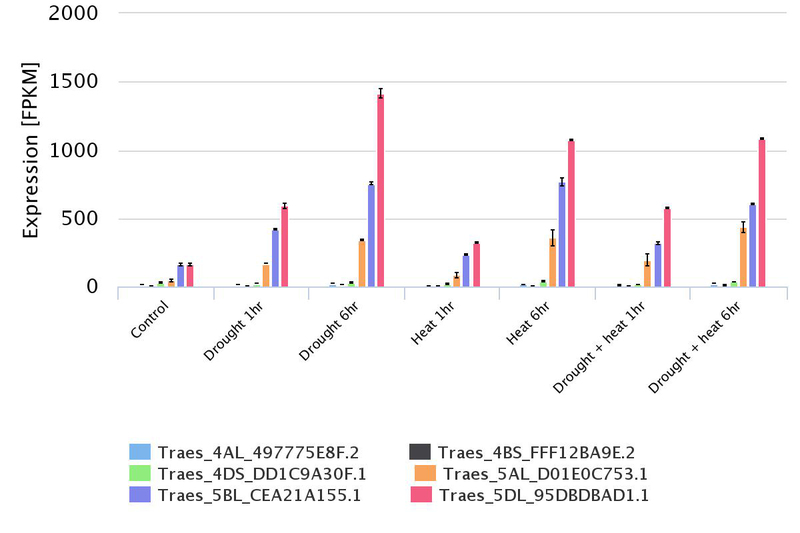 We also analysed the expression profiles of TaFER-4A, TaFER-4B, TaFER-4D, TaFER-5A, TaFER-5B and TaFER-5D under drought stress, heat stress and their combination in the expression database (http://wheat.pw.usda.gov/WheatExp/) . TaFER-5A, TaFER-5B and TaFER-5D were all induced by drought stress, heat stress and their combination (Additional file 7: Figure S5). These results indicate that, in addition to functioning as the iron storage protein in the development stages, plant ferritins may also function as stress-responsive proteins. Previous studies have demonstrated that ferritin gene expression is induced by heat treatment. PpFer4 expression was significantly induced by 6 h of treatment at 40 °C . In barley caryopses, heat treatment at 0.5 h, 3 h and 6 h could induced the expression of the ferritin gene-corresponding probe Barley1_02716 . In cotton leaves, the expression of the ferritin gene-corresponding probe Gra.2040.1.A1_s_at was induced in cultivar Sicala45 but not in cultivar Sicot53 after 42 °C treatment. We also analysed the expression profiles of the four Arabidopsis ferritin genes after heat stress in the expression database (http://jsp.weigelworld.org/expviz/expviz.jsp). After 38 °C treatment, AtFER1, AtFER3 and AtFER4 expression was induced gradually and peaked at 3 h. After recovery to normal conditions, the expression levels of these three genes gradually decreased to normal levels. AtFER2 accumulates in dry seed. AtFER2 abundance in vegetative organs is minimal, and its expression is not induced by heat. Taken together, we believe that induction of the plant ferritin gene by heat is a common phenomenon and that ferritin genes are involved in coping with heat stress. We analysed the 2000-bp sequence of TaFER-5B upstream of the start codon and did not identify the typical heat stress responsive element (HSE) (Additional file 8: Figure S6). This result indicates that TaFER-5B expression is not regulated by heat transcription factors but by other pathways. We also analysed the promoter region of the four Arabidopsis ferritin genes. HSEs were identified in the promoter regions of AtFER2, AtFER3 and AtFER4 but not in AtFER1 (Additional file 8: Figure S6). These results indicate that heat transcription factors participate in the regulation of ferritin genes; however, other pathways are also involved because some ferritin genes are induced by heat even though their promoter regions do not have the typical HSE. Under drought or other stress conditions, free iron in plants increases rapidly and induces the expression of ferritin to cope with the stress . This phenomenon may be a regulatory mechanism to induce the expression of ferritin under heat-stress conditions. In addition, in the OsHDAC1 overexpression lines, ferritin gene expression is decreased . AtFER1 and AtFER2 are the target genes of AtGCN5, and the expression levels of AtFER3 and AtFER4 are decreased in the mutant gcn5-1 . These results indicate that histone modification may be involved in the regulation of the ferritin gene. Some abiotic stress and hormone responsive elements were identified in the promoter sequence of TaFER-5B (Additional file 8: Figure S6). The expression of TaFER-5B was also induced by PEG, H2O2 and Fe-EDDHA treatment (Fig. 2b, c, d). We also analysed the expression profiles of the four ferritin genes under abiotic stress conditions using the Arabidopsis expression database (http://jsp.weigelworld.org/expviz/expviz.jsp). After cold treatment, only the expression of AtFER3 was induced. Under salt-stress conditions, the expression of AtFER1 and AtFER3 was increased 6-fold and 3-fold, respectively, but the expression of AtFER4 was not altered. Under drought-stress conditions, only the expression of AtFER1 and AtFER3 was induced. In rice, OsFER2 was induced by Cu, paraquat, SNP (a nitric oxide donor) and iron . Ferritin is one of the genes up-regulated in response to drought in the SSH cDNA library of soybean nodules . These results indicated that ferritin gene expression is induced by various abiotic stress treatments. Thus, the regulation of the ferritin gene is very complicated. In this study, we demonstrated that TaFER-5B is induced by heat stress and other abiotic stresses. Overexpression of TaFER-5B in both wheat and Arabidopsis enhanced heat, drought, oxidative and excess iron stress tolerance compared with control plants. Transgenic tobacco plants ectopically expressing MsFer are more tolerant to oxidative damage and pathogens compared with WT plants . Transgenic grapevine plants overexpressing MsFer were used to evaluate the tolerance to oxidative and salt stress . What is the mechanism by which plant ferritin improves tolerance to abiotic stress? We evaluated the accumulation of O2− and H2O2 in transgenic plants and control under heat stress, which revealed that the transgenic plants accumulated less O2− and H2O2. High temperature induces the production of ROS and cause oxidative stress. We hypothesized that when a plant is under oxidative stress caused by high temperature, ferritin transforms toxic Fe2+ to the non-toxic chelate complex and protect cells against oxidative stress. When no additional ROS scavenging mechanisms are available, the function of ferritin is amplified and plays an important role. Ferritins are conserved throughout the plant kingdom, and two genes per genome have been identified in all studied cereals. In this study, we cloned TaFER-5B from wheat and determined that TaFER-5B is induced by heat stress and other abiotic stresses. The relationship between TaFER-5B and abiotic stress tolerance was characterized. Our results suggest that TaFER-5B plays an important role in enhancing tolerance to heat stress and other abiotic stresses associated with the ROS scavenging. The common wheat genotype “TAM107” , which has a thermotolerant phenotype released by Texas A&M University in 1984, was used in this study. Seeds were surface-sterilized and soaked overnight in the dark at room temperature. The sprouted seeds were transferred to petri dishes with filter paper and cultured in water (25 seedlings per dish). The seedlings were grown in a growth chamber at a temperature, light cycle and humidity of 22 °C/18 °C (day/night), 12 h/12 h (light/dark), and 60%, respectively. Briefly, 10-day-old wheat seedlings were treated. Drought stress, oxidative stress and excess iron stress were applied by replacing water with PEG-6000 (20%), H2O2 (5 mM) or Fe-EDDHA (10 mM), respectively. For high-temperature treatments, seedlings were transferred to a growth chamber maintained at 40 °C. Untreated control seedlings were grown in the growth chamber under normal conditions. Leaves were collected from the seedlings at 1 h, 3 h, 6 h and 12 h after stress treatment, frozen immediately in liquid nitrogen and stored at -80 °C until RNA isolation and other analyses. Arabidopsis thaliana ecotype Col-0 was used as WT. The T-DNA insertion lines fer1-1 (SALK_055487), fer2-1 (SALK_002947), fer3-1 (GABI-KAT_496A08) and fer4-1 (SALK_068629) were obtained from The Arabidopsis Information Resource (TAIR, http://arabidopsis.org) as described previously [19, 40]. fer1-3-4 and fer1-2-3-4 were generated as described in previous studies [19, 24]. Seeds were surface-sterilized and cold treated at 4 °C for 3 days in the dark, and then seedlings were grown at 22 °C on horizontal plates containing Murashige and Skoog (MS) medium (pH 5.8) solidified with 0.8% agar unless otherwise specified. Plants were grown at 22 °C under a 16 h/8 h (light/dark) photoperiod in the greenhouse. Total RNA was extracted with TRIzol reagent (Invitrogen), and purified RNA was treated with DNase I. Subsequently, 2 μg of total RNA was reverse transcribed by M-MLV reverse transcriptase (Promega, USA). Based on the candidate probe sequence (Ta.681.1.S1_x_at), a pair of gene-specific primers was used to amplify TaFER. The primer sequences are listed in Additional file 9: Table S1 (1, 2). Database searches of the nucleotide and deduced amino acid sequences were performed by NCBI/GenBank/Blast. Sequence alignment and similarity comparisons were performed using DNAMAN. Sequence alignments were performed by ClustalX, and the neighbour-joining tree was constructed using the MEGA5.1 program. Quantitative real-time PCR (RT-qPCR) was performed to determine the relative expression pattern of TaFER-5B with specific primers designed previously . The 2-ΔΔC T method  was used to quantify the relative expression levels of TaFER-5B, and wheat β-actin was used as the endogenous control. Each experiment was independently repeated three times. Additional file 9: Table S1 (3, 4, 9, 10) lists the RT-qPCR primers. Total protein extracts were prepared with sample buffer (250 mM Tris–HCl, pH 6.8, 10% SDS, 0.5% bromophenol blue, 50% glycerol and 5% β-mercaptoethanol). Protein concentration was measured with a Coomassie Brilliant Blue binding assay. Protein samples were separated by SDS-PAGE and blotted onto PVDF membranes for immunoblot analysis. 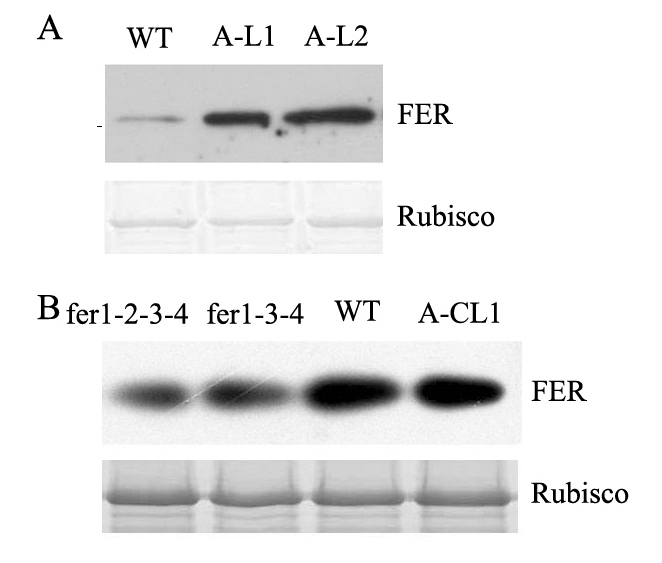 Immunodetection of ferritin was performed using rabbit anti-FER polyclonal antibody (Agrisera). The complete ORF of TaFER-5B driven by the maize ubiquitin promoter was inserted into vector pBract806. The resulting expression constructs were used for the production of TaFER-5B-overexpressing transgenic wheat lines. Immature embryos from cultivar JM5265 were used for wheat transformation via the particle bombardment method. The presence of a TaFER-5B transgene in the transgenic lines was verified by PCR. Additional file 9: Table S1 (5, 6) lists the primers used for PCR. Seeds of JM5265 obtained from Institute of Cereal and Oil Crops of the Hebei Academy of Agriculture and Forestry Sciences and transgenic lines were sown in pots containing potting soil and grown under the above-mentioned conditions. 5-day-old seedlings were directly exposed to 45 °C for 18 h, typically at 9 AM, in a lighted growth chamber and then shifted to 22 °C to the previous day/night cycle for recovery. The results were photographically documented after 5-d at 22 °C. The complete ORF of TaFER-5B was amplified with primers (Additional file 9: Table S1). The PCR product was digested with Xba I and Kpn I and cloned into the pCAMBIA1300 vector (driven by the CaMV 35S promoter). Agrobacterium tumefaciens strain GV3101 containing this binary construct was used to transform Arabidopsis plants. Transformants were selected on MS medium containing hygromycin (30 mg/L) and subject to PCR amplification. Seeds of WT and transgenic lines were sown on a petri dish with approximately 33 mL of solid medium and grown under the above-mentioned conditions. The plated 7-day-old seedlings were directly exposed to 45 °C for 120 min, typically at 9 AM, in an illuminated growth chamber and then shifted to 22 °C to the previous day/night cycle for recovery. The results were photographically documented after 5 to 7 days at 22 °C. The survival rate was the ratio of surviving seedlings to total seedlings planted. Seedlings that were still green and producing new leaves were scored as surviving seedlings. Electrolyte leakage was measured as previously described . Leaf segments of uniform maturity were cut into discs and washed three times with de-ionized water to eliminate external residues. Six discs were placed in test tube flasks with 20 mL of de-ionized water and incubated at 42 °C for 1 h. After incubation at room temperature for 24 h, the conductivity of the solution was read with a Horiba Twin Cond B-173 conductivity metre (HORIBA Ltd, Kyoto, Japan) and noted as T1. Then, the sample was boiled for 15 min to kill the tissues, followed by incubation at room temperature for 24 h. Then, the conductivity of this solution was recorded as T2. Ion permeability was measured as T1/T2. The experiment was independently repeated in triplicate. The maximum efficiency of photosystem II (PSII) photochemistry, the Fv/Fm ratio, was measured using a pulse-modulated fluorometer (MINI-PAM, Heinz Walz, Effeltrich, Germany). Heat treatment was performed by transferring the plants to another growth chamber at 38 °C for 2 h. The Fv/Fm ratio was measured immediately after heat stress. Plants were harvested for assays of ROS accumulation and antioxidant enzyme activities. H2O2 content was determined following the protocol of the H2O2 Colorimetric Assay Kit (Beyotime). The activities of the antioxidant enzymes CAT and GR were determined using the CAT Assay Kit (S0051; Beyotime) and GR Assay Kit (S0055; Beyotime), respectively, according to the manufacturer’s instructions. Fe contents were analysed by inductively coupled plasma atomic absorption spectrometry (ICP-AAS). Samples were mineralized as described previously . We thank Jianhe Yan (China agricultural university) for help in the measurement of iron content. This work was supported by the National Natural Science Foundation of China (31571747) and National Key Project for Research on Transgenic (2016ZX08002-002). Data are available in a supplementary file, and materials are available from the authors upon request. QS and HP designed the research. XZ, XG, FW, ZL, LZ, YZ and XT performed research. XZ, XG, HP, ZN, YY, ZH and MX analyzed the data. XZ and HP wrote the paper. All authors read and approved the final manuscript.